Since moving to Texas, I’m a little disappointed that March 14 occurs during our spring break every year. Several Pi Day traditions have survived in my classroom, despite the fact that I don’t get to celebrate with my students in person. The day before spring break, I greet every student at my classroom door, hand each of them this greeting card, and wish them an early “Happy Pi Day”. Upon starting class, we briefly discuss the history of pi and I proceed to recite 50+ digits as my students gaze at the back of the greeting card to catch my bluff… only to realize I really am reciting memorized digits. This usually challenges a few of them to study and exceed my record post-break. Someone beats me every year, and it’s usually a student I’d never expect to “own” this type of challenge. Fun stuff – not very practical, but curiosity about any mathematical topic is powerful, so I’ll take it. I also tell students to send me a “Happy Pi Day” e-mail on March 14 at 1:59 AM or PM (I don’t judge… it IS spring break after all) and as long as the e-mail message is time-stamped 1:59, the student will gain a bonus point on our next test. I love watching my inbox explode as a result of this offer. Students often e-mail me from other time zones and tell me where they’re spending their break. And then, the crickets chirp a bit. Then someone says something about decimals that doesn’t make much sense. Then, they just stare at me. Teachers who celebrate Pi Day with students – will you make it your mission to help students understand that every circle is about triple the distance around than it is straight across? Every circle that ever was and every will be must possess this mathematical truth, or it’s simply not a circle. Some students have memorized a statement like, “Pi is the circumference divided by the diameter.” Not bad. But, when asked, “But why is pi a little bit more than 3?” in my experience, students have absolutely no idea. When I taught younger kiddos, we wrapped string around plastic lids and any circular object we could get our hands on, then we measured diameters, and “discovered” pi. It’s not a new lesson, but it seemed to click with younger students. 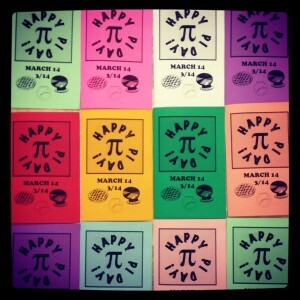 Make discovering pi part of your festivities if you don’t already, and enjoy your Pi Day! And… stunts like this show exactly why I love living in Austin, Texas! 2 Responses to Why Pi? I love the idea of having students e-mail you at 1:59! We’re out of school tomorrow, too. So, I conceded by celebrating on Wednesday. I think I’ll definitely try the e-mail idea next time we miss pi day, though. And, I definitely want to make cards next year. Your cards are adorable! Thanks for stopping by, Sarah! I look forward to reading your pi synopsis, and thank you for all that you share as well!